SAGE MANDALA is a fun torch-fired enamel pendant. SAGE MANDALA is a round copper disc that I have enameled with my torch. 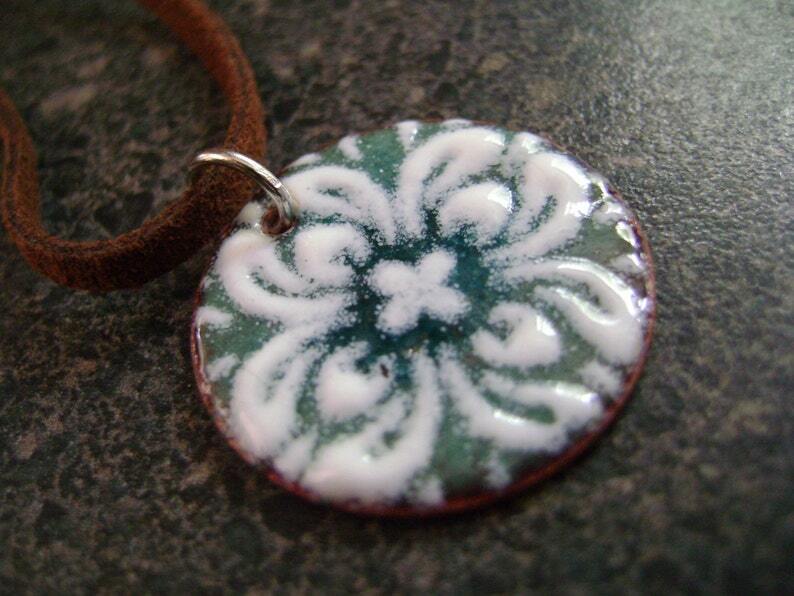 The back of this pendant was enameled first in order maintain the integrity of the front design of the colored base, topped with a white puffy mandala pattern. All of my enamelled pieces are one of a kind as they are each created by hand. This earthy pendant is finished with a brown suede cord with a lobster clasp. SAGE MANDALA is shipped professionally tagged and boxed - perfect for gift giving! Contact me if you would like this pendant created in your color choice! If you are looking to add unique, quality jewelry to your retail shop or gallery, OR need custom work, please contact me. I would be happy to discuss! !